Dear little Puff died suddenly this evening in our vet clinic in Helena. Puff had come to us two years ago as a tiny, sickly 4-week old kitten. She had been dumped by the I-90 frontage road near Drummond, Montana. The woman who called us about her said that if we couldn't take her, one of her relatives would shoot the kitten when he came back from an out-of-town trip. Ninety minutes later the woman arrived at the ranch. Puff had the worst upper respiratory infection we'd ever seen. She could barely breathe. Her eyes were sealed shut, and her eyelids were filled with pus. We didn't know if the kitten would survive, but we were certain she'd lose her eyes. Thanks to some incredible veterinary care by our primary care vet, Dr. Brenda Culver, Puff not only lived but kept her eyes, too. She was in the hospital for two long months while Brenda did multiple eye surgeries to preserve her vision. Puff's eyes were so bad that Brenda initially had to slit the eyelids to drain all the pus out. But the intensive care paid off, and Puff finally came home to the ranch. We never really considered her disabled because she could see, but she ended up living in the cat house with the rest of the gang. She continued to have repeated bouts of upper respiratory infections, and her eyes were always goopy, so we had to wash her face every day. Puff's breathing stayed a bit raspy. Her left eye remained a problem because the eyelid kept trying to adhere to the surface of the cornea. So tissue would eventually creep out across the eyeball and attach to the cornea. Thus every few months we'd take her back to the clinic so Brenda could "clean up" the eye and remove the new growth of tissue. That's why I took her back to the clinic earlier this week (the same day I picked up Tibby and Fibby.) It was time for another of her routine eye surgeries. I was out at the barns this evening at 6:15 when Brenda called and left a voicemail, asking us to call. She didn't say why, but I could tell from her voice that someone had died. I've known Brenda for many years and she's been through a lot of heartache with us, and I knew right away something terrible had happened. We have three animals currently at the clinic -- blind and deaf Blanca the Great Dane puppy, our old girl, blind Kenai, and Puff -- and the only thought that raced through my mind was, "Which one? How?" I called Brenda right back. She was, understandably, very upset when she told me what happened. Puff's pre-anesthetic blood work was perfect. Her surgery had gone fine, just like the many others we had done. The anesthesia, the drugs, the protocols ... everything was the same as before. All the monitoring systems during the operation had shown perfectly normal vital signs. Puff was actually in recovery -- lying in Brenda's lap, in fact -- when Brenda noticed Puff had just skipped a breath. She pulled out her stethoscope to listen to Puff's heart and discovered her heart rate had just plummeted. And then, it stopped. Brenda and her vet techs tried to resuscitate her, but to no avail. Brenda was, of course, distraught and stunned. This was a cat that medically she knew as well as any animal she had ever treated. This was routine surgery, performed nearly a dozen times before. So Brenda is doing a post-mortem tonight and she will also send tissue samples to a pathologist. Between the necropsy that Brenda is conducting and what the pathologist finds, we should have a pretty good idea of why Puff died. The photo of Puff was taken in June by Dawn Norris, a photographer from Boston who spent several days at the ranch photographing the animals. Puff was always, in our mind, a kitten. She was tiny, playful, and had an adorable, affectionate, kitten-like demeanor. Whenever you picked her up, she'd purr and purr. She was the sweetest little cat you could imagine. Goodbye, little Puff. We'll miss you. I brought Copper Kid home from WSU today, and needless to say, he was glad to be back. Even though he turned out not to be a candidate for surgery because the areas of spinal cord compression weren't visible on the myelogram, I thought you'd like to see some photos from the procedure. Kate F., the 4th year vet student who cared for Copper during most of his stay at the hospital, was kind enough to send these to me. In the first photo, the team is moving Copper from the anesthesia induction room to radiology, where the myelgram is conducted. Here's another view of the same process. In this photo, Copper is in radiology and they are about to shave and scrub the back of his neck. The contrast medium is injected in a tiny hole in the spinal column at the top of the spine, and as the fluid moves down the column, the radiologist takes multiple images. Copper made the trailer ride back to Montana without any problem. 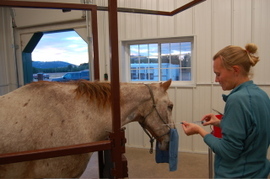 We stopped at Blue Mountain Veterinary in Missoula to pick up Roy the old mule. I had to unload Copper first to get Roy in, and Copper managed to turn completely around inside the trailer so he could come out head first. For a second I thought he was going to go down ... he swayed, his rear end dropped, I held my breath ... but he pulled it out like a champ and then headed for the exit. While at the clinic our equine vet, Dr. Erin Taylor, showed me the X-rays she took of Roy's joints yesterday. My oh my. It was just heartbreaking to see what he's had to endure. The good news is that he was dramatically improved today! When I led him out to the trailer, he had such a nice gait I couldn't believe the difference. It's amazing what some good trimming, shoeing, and joint injections will do for an old, arthritic mule! Ever since we lost our beloved old mule Lonesome George last year, Alayne and I have felt like something was missing around the ranch. We felt, well, mule-less. We didn't realize it until he died, but George had turned us into 'mule people.' Amidst the hundreds of calls and emails to take animals over the past year, we patiently waited for someone to call us about an old mule who needed a home. Someone finally did. The description sounded just like George: sweet, gentle, friendly, easy-going. And occasionally mulish. This is Roy, and he is definitely old. When he first arrived a couple of weeks ago, we could tell just by looking at him that he was downright uncomfortable, if not painful. The way he walked, the way he stood still, the way he was always trying to rest one foot or another -- something was wrong. For one thing, his hooves were in bad shape. Poorly trimmed, his rear hooves in particular looked more like short stovepipes. But his joints seemed to be quite painful, too. 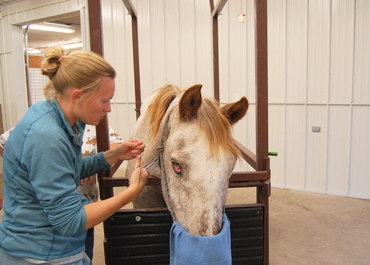 Our equine vet, Dr. Erin Taylor, had looked at Roy for the first time when she was at the ranch the previous week. She diagnosed him as having ringbone -- a severe arthritic condition -- in at least one leg and she suspected other problems in multiple joints in all four legs, but said we'd need to take X-rays to know for sure what was happening. Erin also told us the kind of corrective trimming and shoeing Roy needed on his feet, so our farrier came out yesterday to work on Roy's hooves. We could immediately see an improvement in this sweet old boy's gait. On my way to Pullman, Washington, this afternoon to pick up Copper Kid at WSU, I dropped Roy off at Erin's clinic, Blue Mountain Veterinary Hospital. Erin was going to do further exams and take the X-rays we needed. In the first photo above, Erin is feeling Roy's stifle joint while vet tech Courtney holds him. Demonstrating that he is indeed a mule, Roy hit the brakes when Courtney tried to lead him into the stall. I handed the camera to Erin so I could assist by patting him on the rump with the broom. Erin decided to turn the tables on me and started taking photos of the action. I left Roy there, and Erin said she'd call me once she had all the X-rays taken and evaluated. A few hours later I was heading down Fourth of July Pass in the Idaho panhandle, just east of Coeur d'Alene, when my cellphone rang. It was Erin. All she said was, "He's a walking arthritic nightmare." Oh, no. Sure enough, virtually all of his joints are inflamed with severe arthritis. No wonder he looked like he was in pain. He was. Fortunately, the treatment is simple and straightforward: inject his joints with cortisone. We have an old, sighted Appaloosa named Crazy Horse who we almost euthanized two years ago because he could barely walk, his joints were so bad. We had tried all the fancy, expensive injectable joint drugs out there -- Adequan and Legend, among them. Nothing worked. Then we tried cortisone. The day after we injected his joints with cortisone, he was trotting across the pasture. We couldn't believe it. He's needed only two rounds of the cortisone injections in two years, so we have become big fans of this therapy. There is some risk, because too much steroids can cause an equine to founder, but given what we now know about Roy's condition, it's a risk worth taking. This is a treatment that he absolutely needed. So Erin was going to inject Roy's joints this afternoon, and I will pick him up tomorrow on my way back to the ranch with Copper. Yes, Copper's finally coming home. He tested negative for EPM, unfortunately, so we have nothing else we can do for him except manage his Wobbler's the best we can. On a Saturday evening a couple of weeks ago, our barn cat Ash came limping out of one the pastures, her right rear leg suspended in the air. She was meowing in distress. I picked her up and felt a large lump in her abdomen ... something soft and very swollen. Egads. I called our clinic in Helena, Montana Veterinary Specialists, to let the vet on emergency duty know I was on the way in. Well, it turned out she had several broken bones in her foot and a hole in her abdominal wall. We think Ash got stepped on by one of the horses. We've never had a barn cat squashed by a horse, but there's always a first time for everything! Our vets did surgery on her abdomen and put her foot in a splint. When I picked up the kittens, Tibby and Fibby, yesterday, I also brought Ash home. In the photo above, Ash is with vet techs Jayme J. and Heather A., who were changing her splint and showing me how to re-wrap it. 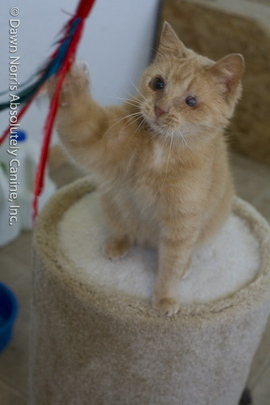 Ash will need to stay confined in a cage for the next six to eight weeks, making her one very unhappy barn cat! We consider our barn cats to be staff -- they've got a job to do, rodent control! -- but for some reason workers comp declined to cover her medical costs. Apparently to be eligible for coverage, staff need to get cash compensation for services rendered, not just room and board. Dang. 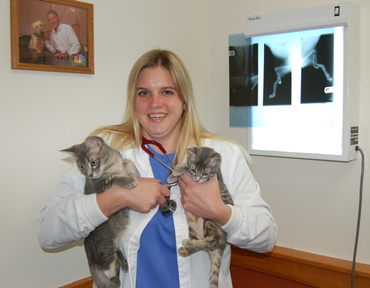 Today I picked up our two kittens with deformed legs at our vet clinic in Helena, Montana Veterinary Specialists. They had been at the clinic getting their limbs X-rayed, general medical exams, and bloodwork. I took this photo of Dr. Jennifer Rockwell holding the two tykes. That's one of their X-rays on the lightboard. Jennifer and the rest of the team at the clinic provided wonderful care for the kittens, and of course everyone there fell in love with them. Yes, we named them Tibby and Fibby, a suggestion by one of our blog readers. In a blog comment posted on Aug. 14, Chris wrote that the names were "Just a way to try and give back what they don't have, at least in name and spirit!" We liked the idea and the names seemed to fit them! We learned from the X-rays that both kittens actually do have tibias but not fibulas ... and their tibias are not exactly normal, to say the least! 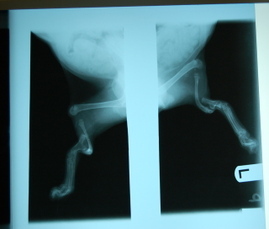 Here is an X-ray of a normal feline rear leg. You can see that straight vertical limb -- that's the tibia, which is the shin bone in humans. 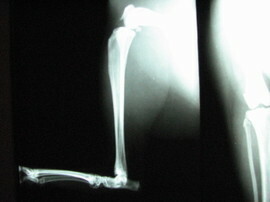 The fibula, which is much smaller and lighter in structure, runs along behind it and isn't visible in this X-ray. The tibia and fibula connect to the femur, or thigh bone, at the top of the image. Here is the X-ray of Tibby's leg. You can see how radically different it is. Not only is there no fibula, but the tibia -- which is supposed to be long and straight and thick -- is short and twisted and circles completely around. 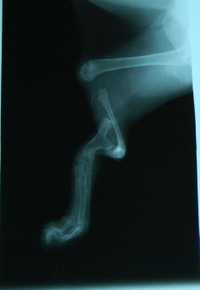 It also doesn't connect at all with the femur, which is why their legs dangle and flop when we hold the kittens up in the air. Weird, huh? So weird that our internal medicine specialist at the clinic, Dr. Britt Culver, has never seen anything like this before, and nor has Jennifer. So here's a close-up of the X-ray that was on the lightboard, showing both limbs. With the tibia completely malformed and the fibula entirely missing, we figured Tibby and Fibby seemed like appropriate names for these two ... as Chris said, to give them back at least in name and spirit. And they, like all of our animals, don't let their disability slow them down one bit. Indeed, we set them on the floor of the waiting room at the clinic, and they took off to go exploring! Well, enough X-rays. 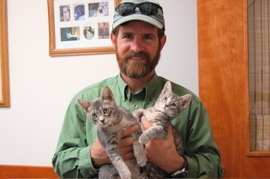 Here they are again in the exam room, with me serving as the kitten holder this time. Tibby and Fibby weren't the only cats I picked up at the clinic today, though -- there was one more. But her story will have to wait till tomorrow's blog! 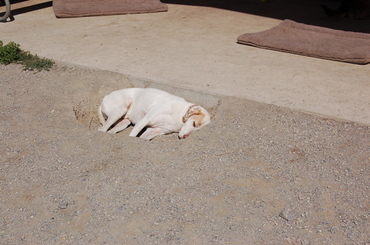 We've spent the summer asking visitors to watch where they're walking when we get up to the Widget's House porch because of the whopping holes the dogs dig in the gravel. Now, these aren't "I'm-digging-because-I'm-bored" holes or "I'm-digging-because-I've-always-wanted-to-visit-China" holes. No, these are something entirely different. These are "I'm-digging-because-I-want-a-firm-bed-in-a-hole" holes. Please note the very comfortable but unused West Paw Nature Nap beds scattered across the porch. Not shown in this photo are another three very comfortable but unused Kuranda dog cots on the porch as well, each covered with a Nature Nap bed. And if we fill these holes up, they're back by sundown. 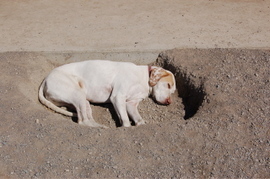 So we've learned to accept the fact that sometimes -- well, quite often actually -- there's just nothing better than your very own bed in a hole. That's deaf Tyler, by the way, showing that his hole is a carefully engineered custom fit. Okay, so after a bad week, I figured it was time for something on the light side. Fortunately, we had a candidate in blind Callie (although some might say she's actually on the heavy side). Alayne got this photo of Callie, she of the Plumpettes fame, enjoying one of her special upside-down deep sleeps. Please note the artful use of the tongue sticking out. 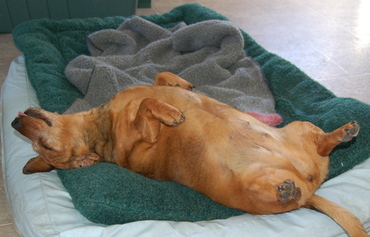 That just might be the ultimate sign of pure relaxation for a sleeping Dachshund. Our equine vet, Dr. Erin Taylor, called last night at 11:30 p.m. to say Tonto had just died. Erin said she was surprised because he had come through the surgery so well and then recovered so quickly and easily from the anesthesia. But in the end, it had all been just too much for his old body. I told her we didn't have any regrets about doing the surgery and were glad we had given him a chance. Erin said, "You're right, because if we had gone ahead and euthanized him earlier, you would always have wondered 'what if?' At least you know you did everything you could." Our only regret is that we weren't there with him when he died. It's so important to us that we're with them when they go, so when they die like this, it hurts even more. It's been a rough two weeks. Our equine vet, Dr. Erin Taylor at Blue Mountain Veterinary Hospital in Missoula, called early this afternoon to say Tonto had taken a serious turn for the worse. Given his symptoms and following further examinations, she concluded that he might have a nephrosplenic entrapment. She explained that in the horse there is a ligament that extends from one kidney to the spleen, and the colon can sometimes get wrapped around, or hooked, on that ligament. Erin was going to try a fairly simple procedure to "bounce" the colon off the ligament. She'd know in 30 minutes if it worked and would call me with a report. It didn't work, and he was getting worse. 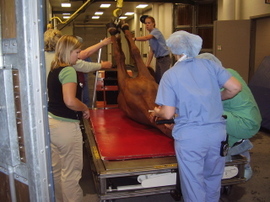 There was another possible procedure, in which the horse is put under general anesthesia, placed on its back, and then rolled back and forth to dislodge the colon. She doubted that would succeed in Tonto's case, and given the risk of putting a horse -- especially an old one -- under anesthesia, Erin didn't think it was worth doing. If it didn't work and he still needed surgery, now we would be risking anesthesia twice. Our options at this point were to simply wait and see if the problem could somehow resolve on its own; euthanize him; or proceed directly to surgery. Neither Erin nor I thought the first option was acceptable or realistic. He was in a lot of pain and deteriorating rapidly. Erin walked me through what we faced if we decided not to euthanize him and went with the third option. It would be major abdominal surgery, which is plenty risky for an elderly gent like Tonto, who is probably 25 years old. Not only does he have to survive the surgery, but the recovery as well, with all its complications. It's also expensive -- about $4,000. I told Erin that, yes, we could definitely think of lots of other ways to spend $4,000, and we knew that some people would definitely question -- understandably -- why we would do this for an old, blind horse. But the only thing Tonto has is his life, and how could we take that away from him if there was a reasonable chance surgery could save him? We certainly understood we might lose him during surgery, or to post-surgery complications, but Alayne and I couldn't live with ourselves if we didn't at least try. So I asked Erin to proceed to surgery. She said, "Okay, but it will take us 20 to 30 minutes to set up. You've still got time to call us if you change your mind." I told her we wouldn't be changing our minds. About two hours later, Erin called to say she had just finished surgery and -- surprise! -- Tonto had an another intestinal problem: he had a pelvic flexure retroflexion, in which the colon is flipped backwards 180 degrees. Ouch. There was a lot going on in there! She said there was no way that could have been fixed other than with surgery. Tonto wasn't completely awake yet from the anesthesia but was stirring. They were holding him down for a while longer because horses will sometimes try to get up too quickly, before they are able to function, and break a leg or otherwise injure themselves. She'd call when he was up and recovered. Ten minutes later the phone rang, and Tonto was fully up on his feet and in the recovery room. Erin said, "He's bionic! He got to his feet with no problem at all, he just sprang right up!" The photo at the very top of this post is one I took last night of Tonto at the clinic; Erin was suturing his catheter into place. 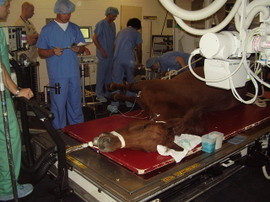 The second photo is one Erin took with her cell phone camera while the vet techs were prepping him for surgery. 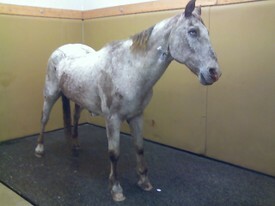 The third photo is another cell phone shot Erin took of Tonto in the recovery room. We've cleared the first hurdles. Now we have to get through the post-operative phase, and that includes getting his digestive system working again. Please keep your fingers crossed for this old boy. It was shortly after 5 p.m. today when I noticed blind Tonto wasn't eating his evening grain. Uh oh. In the several years we've had Tonto, I have never seen him not eat. Then, before I could even say "colic," he sank to his knees in the corral. And with that, my heart sank too. I knew he was colicking. We got him up, listened to his heart rate (fast) and took his temperature (normal). I gave him a dose of Banamine, an anti-inflammatory. But even as we worked on him, Tonto got worse. He tried kicking at his belly. He finally just lay down and rolled over on his side. 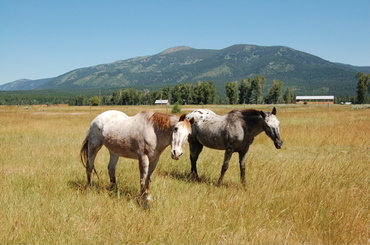 I called our equine vet, Dr. Erin Taylor at Blue Mountain Veterinary Hospital in Missoula. She told me to load him up and bring him in, and said she'd go for a run with her dogs while I made the hour-plus drive to the clinic with the horse trailer. Erin was waiting when I finally arrived with Tonto. First she did a general exam, then a rectal to see what what was going on internally with his intestines. 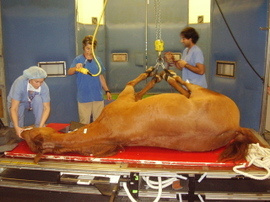 In the photo above, Erin has inserted a tube through Tonto's nose and then down into his stomach. She pumped water in, then siphoned out the contents of his stomach. 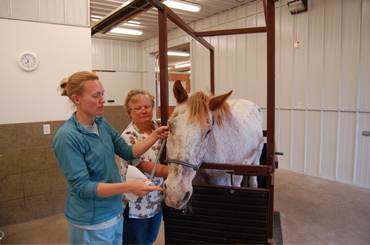 Also in the photo is vet tech Janet L., who helped Erin with the procedures. 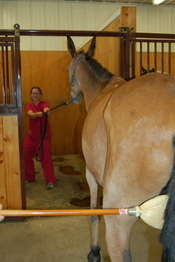 In this photo Erin is preparing a catheter so Tonto can have IV fluids throughout the night. The blue cloth over his face served as a "snort 'n sneeze" shield so we wouldn't get sprayed by Tonto while Erin was pumping the water into his stomach. He was hanging his head low because he'd been sedated for all of this. 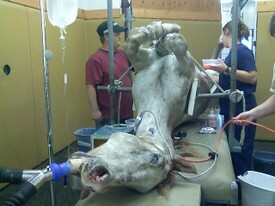 We led him out of the horse stock, put him into a stall, and hooked up the IV fluids. It's too soon to say how serious a case of colic he has; we'll have a much better idea tomorrow.